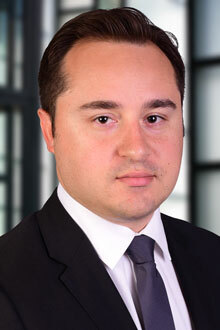 Christopher Martino is an associate in the Newark office. Mr. Martino focuses his practice on a variety of civil litigation defense matters including professional liability, medical malpractice, and product liability defense. Mr. Martino routinely represents skilled nursing and assisted living facilities on a variety of matters involving professional negligence, decubitus ulcers, falls, elopement, physical abuse, medication error and premises liability. Mr. Martino also defends physicians, nurses, and medical facilities in medical malpractice actions. He has successfully represented retail tool manufacturers in product liability matters, and national retail stores on premises liability claims. He has also defended matters involving automotive liability, construction litigation, and insurance coverage issues. Mr. Martino graduated from The Johns Hopkins University in 2009 with a degree in Political Science from the Zanvyl Krieger School of Arts and Sciences. While attending Johns Hopkins, Mr. Martino was a four-year member of the NCAA Division III Football team. He thereafter received his Juris Doctor on scholarship from The Rutgers University School of Law in 2013 where he served as Articles Editor for the Rutgers Journal of Law and Public Policy and was a member of the Rutgers Advanced Child and Family Advocacy Clinic.